This is very important information because not all oils are created alike. Different oils serve different purposes. We must remember, one of the most common culprits of reduced hair growth is hair breakage. Most of the time, the key to longer, stronger hair is preventing this breakage of the hair shaft. 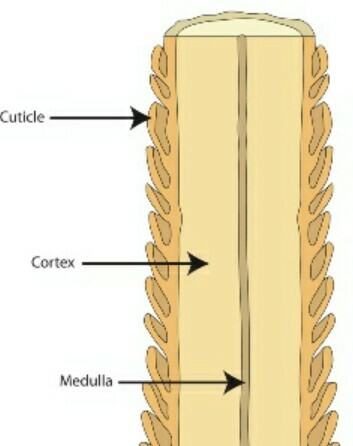 The hair shaft is comprised of the Medulla, Cortex and Cuticle. As you can tell by the picture here, the Cuticle is essentially the outer most portion of the hair shaft. The function of the cuticle is protection. You can think of the hairs’ cuticle as its’ armour. This is a vital component of the hair shaft. If the hair’s cuticle is damaged, you are in danger of compromising the entire hair shaft, which ultimately can lead to breakage. Breakage then leads to less hair retention which will make it seem as though your hair is not growing, when in actuality it is breaking at the weak points of the hair shaft. Avocado oil – Contains several vitamins and nutrients such as Vitamins A, B, D E, amino acids, iron and folic acid. Avocado oil is one of the best oils for moisturizing dry, brittle and damaged hair, thus, preventing and/or reducing breakage. Coconut oil – Contains fatty acids which bind to the proteins in the hair, protecting the strands from breakage. Coconut oil also contains Vitamin E, K and iron, which help to boost hair growth. This oil contains anti-fungal and anti- bacterial properties which keep the scalp healthy. The scalp must be healthy for proper and flourishing hair growth. Olive oil – This oil also contains anti-bacterial and anti-fungal properties that encourage a healthy scalp. Olive oil contains Vitamins A, E and mono-unsaturated fatty acids which help to coat the shaft of the hair, keeping the strands healthy and protected, making it less prone to breakage. Again, these oils are actually ABSORBED into the hair, providing an abundance of benefits. Not all oils are able to penetrate the hair shaft, so I would definitely keep these oils as a staple in your haircare regimen. I use this brand of Avocado oil. (Refer to link below) The coconut oil that I use is made from Spectrum, it is unrefined and is listed in the previous posts. The olive oil that I incorporate into my hair regimen is cold-pressed extra virgin olive oil, which can be found in any local grocery store.